In my ongoing search for a tasty snack bar/granola bar/energy bar that is paleo-friendly, I put this grain-free granola bar recipe to the test. 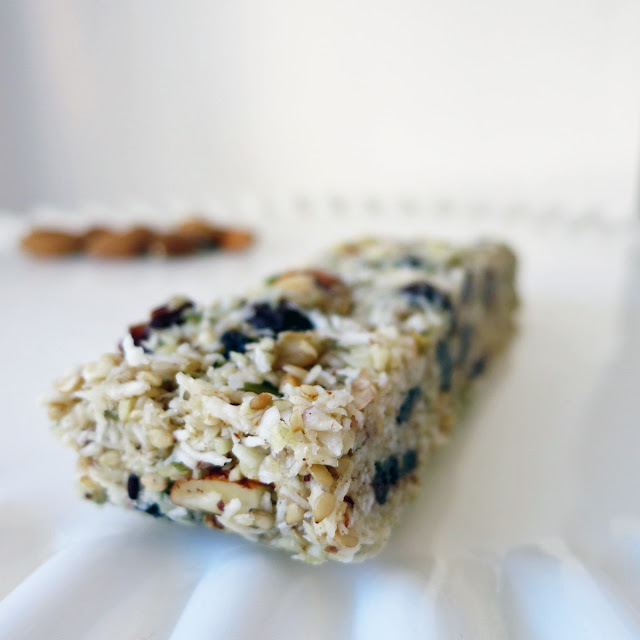 The previous energy bar recipes I've tested are held together almost entirely by dried fruit (Lemon Coconut Cashew Bars and Apricot, Pecan & Chocolate Energy Bars). Ultimately, they were more akin to Larabars than granola bars. As a result, some of my taste-testing friends found them too sweet. These aren't quite as sweet as the previous two recipes: they are held together with a little honey (sticky), some coconut oil (solid at room temperature), and a LOT of physical pressure. The unprocessed fruit and nuts add great texture, much more like traditional a granola bar - a welcome change to the sticky uniformity of a fully-processed larabar-style snack. It feels like you're really eating some roughage. Mmmm . . . wholesome roughage. Still, the bars aren't sturdy enough to work well at granola bar length: once they fully hit room temperature the coconut oil becomes soft. Grab one end of the granola bar, and the other half breaks off. Learn from my mistake. Cut them into squares. Then, keep them cool. 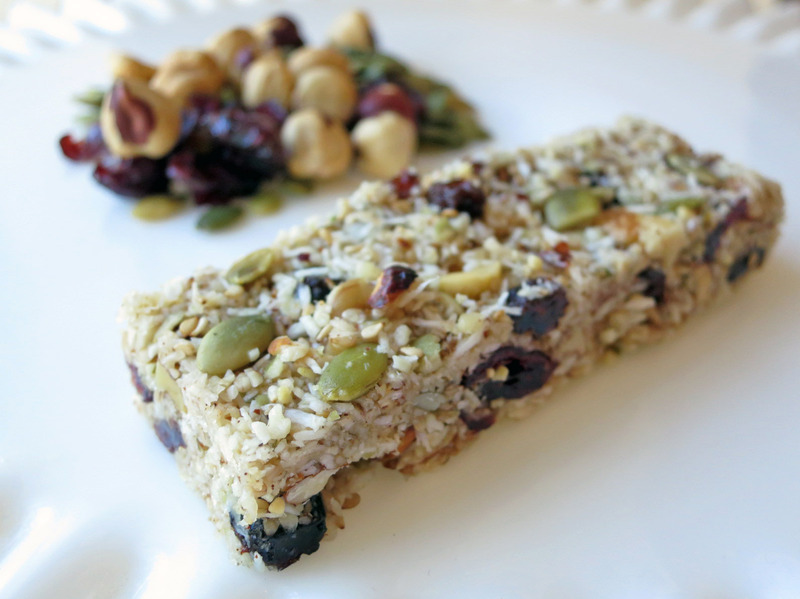 Despite their fragility, this is my favorite snack-bar recipe so far. 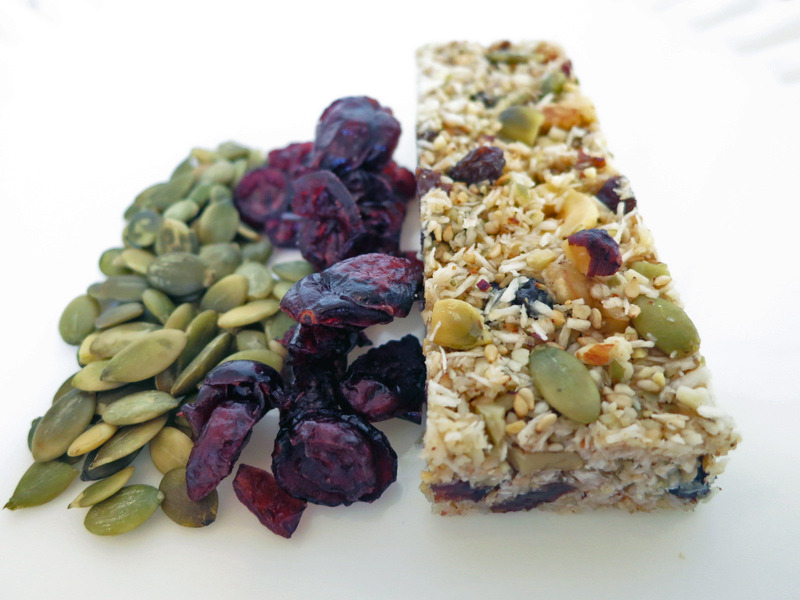 I prefer their "real granola bar" look, taste, and texture. After testing a few more recipes, I plan to return to this and modify it until I have something tasty and sturdy, and maybe just a touch less sweet. Could I cut down on the dried fruit? Replace some honey with more coconut oil? Try baking them to firm them up? Try caramelizing the honey so that it hardens when it cools? These are some of the questions I hope to answer! Combine your choice of nuts in a large bowl. If you'd like deeper flavor, roast briefly in oven and let cool before continuing. 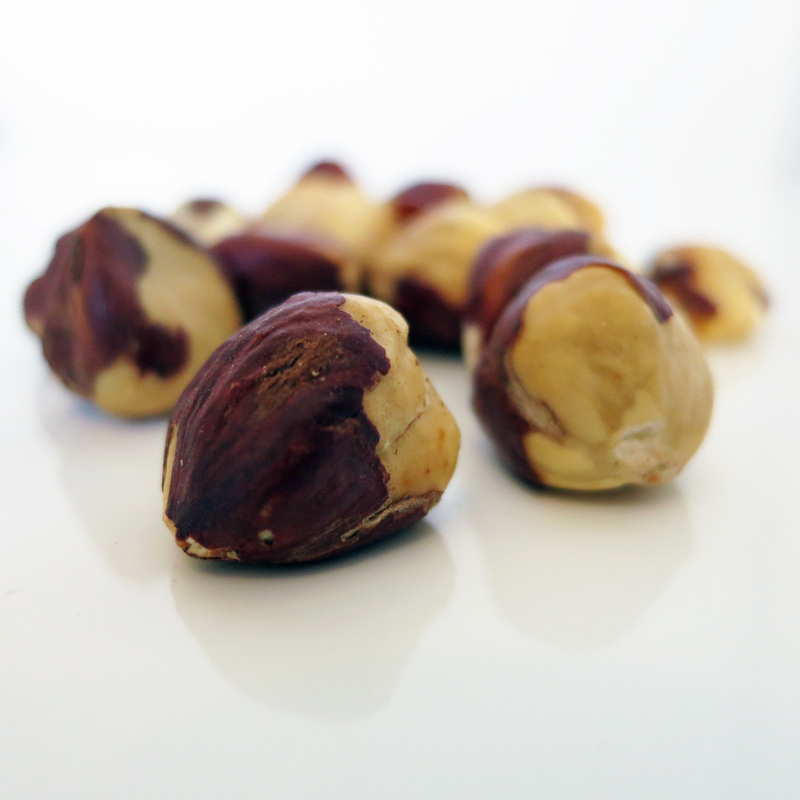 Remove 1 cup of nuts and chop them roughly with a chef's knife. Set aside. Place the remaining 1 1/2 cups of nuts in a food processor and pulse until they reach a more finely ground, gravelly texture. Add the processed nuts to the bowl with hand-chopped nuts, dried fruit, and coconut flakes. Measure honey by first lightly oiling a measuring cup to make it easy to pour out. In a small saucepan, combine honey, coconut oil, salt, and cinnamon. Heat the mixture on medium-low, stirring frequently, until it boils. Remove from heat and stir in vanilla. Pour this mixture over the rest of the ingredients and stir until it is fully distributed. Once it has cooled at bit, you may find it easier to knead the mixture with your hands. Line a 9"x13" pan with parchment paper. Pour the mixture into the pan and press down with all your weight. Really be thorough about compressing it...without effort, they won't stick together well. Refrigerate about 1 hour or until firm. Cut and keep refrigerated or frozen until ready to eat. I'd suggest cutting them into squares, since they aren't very sturdy when cut into rectangles. I'm finding it very difficult (and expensive) to get hold of coconut oil, is there an alternative? There really isn't a great substitute for coconut oil in this recipe: It's liquid when heated, and solid at room temp, which helps hold everything together. If you can't find it in your local grocery store, lots of brands at various price points are available through Amazon. I've listed a few in the "store" section of the blog if you find it helpful! Thanks. I live in the U.K. so its not as popular here. About $10 for a small jar!! I will continue to look though! This recipe is internally inconsistent. At first, it calls for 2.5 C of mixed nuts. Later, in the details, the recipe designer calls out only 1.5 C of nuts. Which is it: 2.5 or 1.5? Recipe clearly states what to do with the 2.5 c of nuts: "Remove 1 cup of nuts and chop them roughly with a chef's knife. Set aside. Place the remaining 1 1/2 cups of nuts in a food processor and pulse until they reach a more finely ground, gravelly texture. Add the processed nuts to the bowl with hand-chopped nuts..."